Janeway Street is a 2-storey terraced cottage-type property built in 1929. 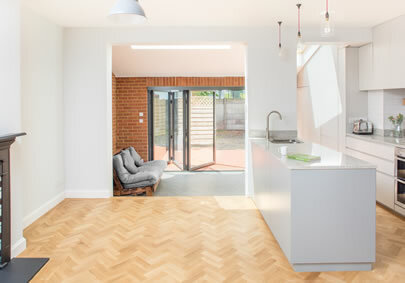 The client’s brief was to extend the property to the rear, to provide a generous and well-lit space for cooking, eating and living at ground level. The project also includes some hard landscaping to the back garden and some remodelling at first floor including a fully refurbished bathroom and fitted joinery. External materials used on the extension include Swanage Red handmade bricks to match the existing brickwork. The finish of the new rear patio is brick to match, laid in a herringbone pattern. The Swanage Red brick has also been used internally in the new extension. Other internal finishes include oak herringbone flooring, ceramic tiles and colour laminated plywood (kitchen units).